A scene commonly enacted in modern times, whether in public or in private places, is that of people assiduously consulting an accessory. This often occurs in ignorance of the individual’s awareness of the social setting. Referred to here is the technical device called variously a ‘smart ’phone’ or a ‘tablet’. There was a religious parallel in the Middle Ages. This was a devotional and status-giving book called a ‘Book of Hours’, often to be seen dangling from the wrist of the wearer. A Book of hours, too, must be mine. The pages closed, two golden clasps. Prayers - (and sometimes secular domestic matters of the sponsoring family). Les Très Riches Heures du duc de Berry, which exists today and can be seen in the Musee Conde, Chantily, France, is a beautiful example of the consummate artistry to be found in Books of Hours. Lavishly illustrated with pictures and patterning, and with French Gothic text it is one of the most precious books in the world. 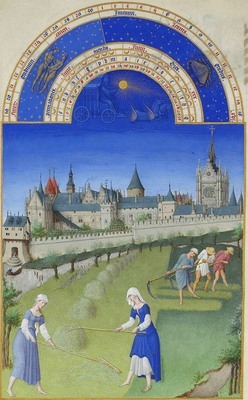 It was created by the Limbourg brothers in about AD1416 and the duc de Berry was their patron. The Limbourgs and their successors made a specialism of producing Books of Hours for wealthy bourgeoisie and nobles all over Europe. Books of Hours are well worth close study, not only for their ecclesiastical content, but also for their insight into the occupations and preoccupations of the mediaeval mind, as well as their artistic merit.